Dear Inquisitive UGLers: Last week you may have noticed a whiteboard near the UGL’s entrance. This was Question Board’s more mobile cousin, Whiteboard, sent as a scout to ask you one simple question. The question was: Can you stump QB? Many riddles were posed, and QB has answers for some of them – but for others, your help is needed. Read on to help QB conquer these confounding queries. Who am I? Please address! This came quite close, but I am not. 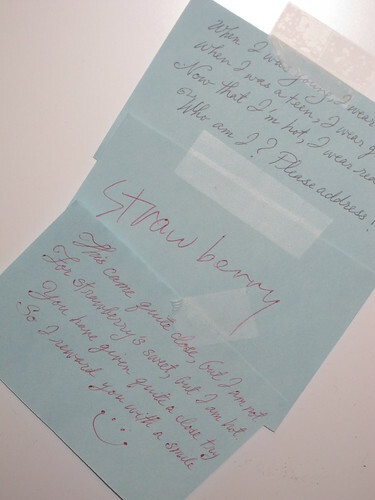 For strawberry’s sweet, but I am hot. QB doesn’t even need any incredibly useful library resources to pull off this one. The answer is as clear as night and day, because it is night and day. Night falls, and day breaks. QB is clearly on a roll here. QB can roll, too! Are you listening, Whiteboard?! This riddle was also answered by an intrepid student…what do you think of their answer? QB thinks they’re close…if you have input, let QB know in the comments. Three men are abducted and held hostage. The captor tells them he will set them free if they can solve this puzzle. He blindfolds the men, and each is wearing a hat, and stations them along a staircase – one at the top, one in the middle, and one at the bottom. On the captor’s cue, they remove the blindfolds. There are two kinds of hats: red & white. The goal is for one of the prisoners to correctly identify which color hat they are wearing. They maynot remove the hats. The hats have been randomized so that there is either 1 red + 2 white or vice-versa. The prisoners must remain facing forward or else they will be executed. How will they survive? They also may not speak for any reason except to guess. If they can walk, then they can switch positions. The one that sees two red/white hats know they must be wearing the other hat. If you can figure it out, please share your wisdom with QB in the comment section. And if you can come up with further riddles and ridiculous (though very interesting) questions, remember to get them to QB via the QB online form. 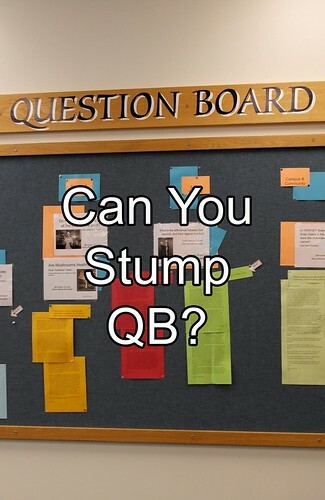 From the QB page you can also browse other questions and QB’s lovingly researched answers. Another option is to visit QB in the lower level of the UGL and read answers there. …Please. Follow cousin Whiteboard down here. QB is so lonely. Thanks to special guest blogger Question Board! This entry was posted in Community and tagged ask a question, QB, resources, riddle: what is the loneliest number, riddles, services, the loneliest number is QB by CN. Bookmark the permalink. Oooh, perhaps you’re correct. Good call!